Bajra Cutlets look so crispy and delicious. Loved the pics. Delicious and healthy cutlet, nice twist to the usual cutlets. New to me but looking yummy.. good one. I love your new pics and the idea of serving chat with these bajra cutlets , super innovative and delicious ! The cutlets with bajra sounds so yum. I love your idea of chat with the cutlets. They looks so good. The pictures look so good! The cutlets look perfectly shaped. Nice one! Excellent clicks and love your chat version of the cutlets. The whole set up is tempting and I am drooling over these cutlets . As all sorts of millets are good for diabetics, I'm trying to add more millet to my dinner dishes. 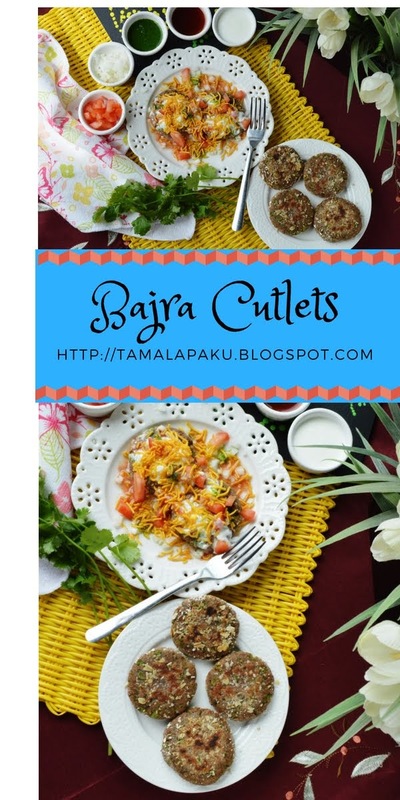 This bajra cutlets is an awesome dish and going to try it out soon. The clicks are very good Harini. Even I think anything can be mixed with aloo to become a tikki..hehehe..this is indeed an excellent one to enjoy. When we soak bajra, we mostly sprout it to be eaten with jaggery..
Wow, such a healthy cutlet with bajra. It looks so perfect for evening snack, will give it a try on sometime. Bajra cutlets rocks, what a wonderful way to sneak those nutritious grains in our diet. My god wish i get that plate rite now. So true... it let’s are so forgiving! Love this guilt free cutlet. Looks delicious! Cutlets with bajra and potato sound nutritious and delicious. A very filling tea time snack. Bajra cutlet sounds superb Haini, it must be a nutritious and healthy snack. Wow.. just awesome sweet recipe... i love it.